As per Internet Live Stats, Google processes over 40,000 search queries every second, which translates to 3.5 billion searches every day. That is a lot of searches! There is a high probability that your audience are contributing to this number by searching for your church, for your type of ministry or for the topics that you teach. Is your ministry visible to them? Most of our SEO discussions in this Simplifying SEO series will revolve around Google, because as per this industry report, Google has a market share of more than 90% when it comes to global search. Google dominates the search industry so much, that Oxford dictionary lists the word Google as the activity of searching for something or someone on the internet. Search Engine Optimization (SEO) consists of a set of ongoing technical and creative tasks. These tasks determine the chances of your church or ministry name showing up in search results when prospective supporters or church members look for your ministry on the internet, using their mobile devices or computers. SEO is not just about your ministry growth, it is also about making the web a better place by streamlining data & information. The objective of every search engine is to help the ‘searcher’ find what they are looking for, quickly and accurately. Here is a simple, high level explanation of how they Google does it. Indexing: Then they organizes the data within their servers using a process called ‘Indexing’ (more details on these topics later). Here is a quick 3-min video from Google, on how Google works. You are aware that Internet usage is increasing and new websites are being created every day. At the time of writing this post, there were 1,895 million active websites (source). This means that search engines need to crawl and index a large amount of data on an ongoing basis. Even though search engines by themselves are evolving and coming up with better ways of crawling, indexing and storing information, wouldn’t it help if each website owner (or blog writer) like you and me make things easier for the search engines by structuring our website in a specified and orderly manner as prescribed by them? SEO is the art of structuring the website information (in a prescribed and orderly manner) in such a way that search engines can easily crawl and index the information. Which in turn makes it easier for them to present it to the end user when they search for it. In simple terms, by structuring your website information in a prescribed manner by each search engine’s webmaster, you clearly communicate to the search engines that you are in a specific area of ministry, serving people in a specific way. This helps the search engine ‘organize’ this information in their servers and then bring it up in their search results, when people come looking for you. Win 2: They help you grow your ministry, by making you visible to your potential audience when they search for your name, type of ministry, message topics or services online. Win 3: When all the websites do this, the world-wide-web becomes a better organized place. That is why SEO is a crucial part of making the online world a better place. The first step is SEO is to determine your current status in search results by conducting a ‘self-search’ on search engines. Note: Do not be discouraged by the results that you might see. You may or may not find your ministry or church listed or highly ranked in the search results right now. Once you start applying the principles that we will discuss in this blog series, you should start seeing improvements in your search ranking. That is the goal. SEO is not a short term or one-time activity, it takes time, consistency and effort. 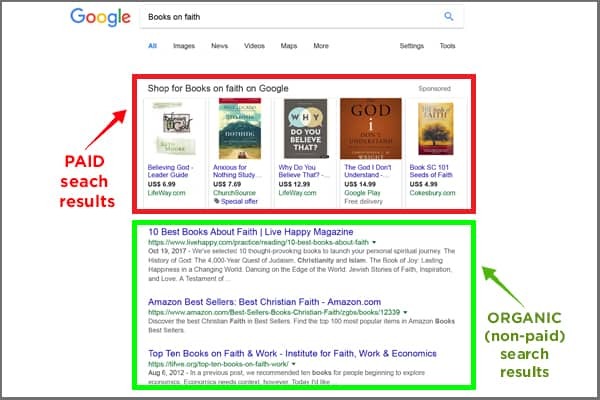 Self-search is a simple but an often-neglected SEO first step. Visit Google.com and conduct a search for the 4 following items. After each search, note down the results from the first 2 or 3 pages. You could take a screenshot or store the information in a spreadsheet for later use. Type your church name or ministry name in the search box. This will give you an idea of your search ranking at the moment. List down the names of ministries or churches that are similar to you and do a search for each of them. This will help you understand where you stand compared to other similar organistions. Search for the topics that you teach or the area of ministry you are in (Eg: Youth ministry, Family ministry, etc). Do a search for each of these terms and note down the results. If you have many, start with the Top 5 or 10. External influencers search: List down key influencers in your area of ministry (Pastors, Evangelists, etc) and see how they rank by conducting a search for their names. Internal influencers search: Search for your name and/or the names of the key influencers inside your organization. This result will give you an idea of the influence that you or your team members. Congratulations! You have taken the first step towards improving your search ranking. In the next part of this Simplifying SEO series, we will discuss how to use this information and also start discussing the next big term in SEO – the ‘Keyword’ research. If you have any questions on the topics we have covered till now, get in touch using the comments section.